Frontend: Loopback has a first class support using AngularJS 1. It comes with lb-ng tools which auto generate angular service which you might find it handy. Backend: Build in swagger support, switchable database at model level and easy-to-create script such as database migration. Well Documented, including Android SDK, iOS SDK and Xamarin SDK. Postgres datasource is still lack of some feature - might have to write raw query to get the job done. Rumor is Google is ditching Angular 1. Therefore there could be a hard time to upgrade to Angular 2 for Loopback. 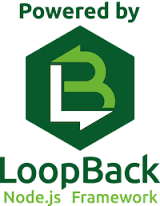 Recently I have been using Loopback a lot in my web project or as mobile application's backend server. Personally I think it is the best NodeJS framework among those I had tried - expressJS, sailsJS and meteorJs. If you are choosing a NodeJS framework for your new project, you might as well give it a try!